The Director General of the Nigerian Maritime Administration and Safety Agency (NIMASA), Dr. Dakuku Peterside, has stated that NIMASA and the Nigerian Customs Service (NCS) are partners in progress in bringing the desired growth and development to the Nigerian maritime industry and by extension the Nigerian economy. The DG who made this statement when he led NIMASA top Management on a courtesy visit to the Comptroller General of the Nigerian Customs Service (NCS) Col. Hameed Ali (Rtd.) at the Customs Headquarters in Abuja described both leadership of the two Agencies as sticklers for transparency while doing things that will serve the best interest of the country. 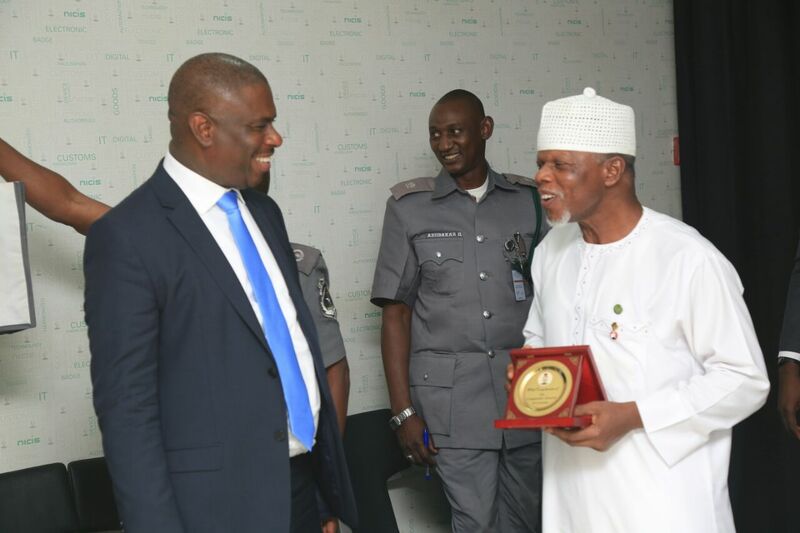 In his words, “The Nigerian Customs and NIMASA are both working to accomplish one purpose, which is to facilitate trade to our country, enhance the revenue of government and ensure that those who do business with us respect the laws of our land and that ultimately they don’t take advantage of our people. As we are all working towards a common purpose, this even becomes more glaring with the new leadership of our both Agencies”. He also seized the opportunity to inform the Customs Service boss that NIMASA has started a process of restructuring and repositioning for the good of the sector in order to make it more business friendly, thereby attracting more investors to the country. “In NIMASA there is a new wave of change in the same direction with the Customs. We are focused on delivering on our mandate to promote the participation of indigenous people in shipping in our country, give every Nigerian an opportunity as well as ensure that our waterways are safer for business to thrive. In the course of doing our work, we have realized that it is inevitable that we must work with the Customs, that is the major reason for the visit”, the DG said. The proposed areas of partnership are; Nigerian Integrated Customs Information System (NICIS), the National Single Window Project and Maritime Security all geared towards enhancing productivity in the sector, transparency, plugging revenue leakages and ensuring maritime security among others. In his response, the CG of the Nigerian Customs Service, Col. Hammed Ali (Rtd.) expressed optimism that the renewed partnership between both Agencies will bring about the growth of the sector and the economy as a whole. “Gone are the days that we feel we should do it alone, today the dynamics have changed, technology has given us a platform whereby we can achieve a lot, share information and also distribution of responsibility, I therefore feel NIMASA is one of the organisations we need to partner with, so your coming is to strengthen the already existing relationship,” the CG said. He assured NIMASA of the readiness of the NCS to partner with NIMASA in the aforementioned areas, noting that “no single government agency can work alone; we all need to work together for the good of this country. It would be recalled that since inception of the Dr. Dakuku Peterside’s administration, the Agency has engaged several Stakeholders and relevant government bodies both locally and internationally to bring transformation to the maritime industry. NIMASA is the government Agency solely responsible for the promotion of indigenous shipping and ensuring maritime safety and security on the nation’s waterways. This present Management is working towards making Nigeria safer for business and a hub for maritime activities in Africa.